Despite having grown up in the affluent suburbs of the nation’s capital, if there’s one thing clear about director Debra Granik it’s her reverence for rural America and the people who live there, particularly for those who chose to live off the grid. In 2010’s outstanding Winter’s Bone, it was the backwoods of the Ozarks. 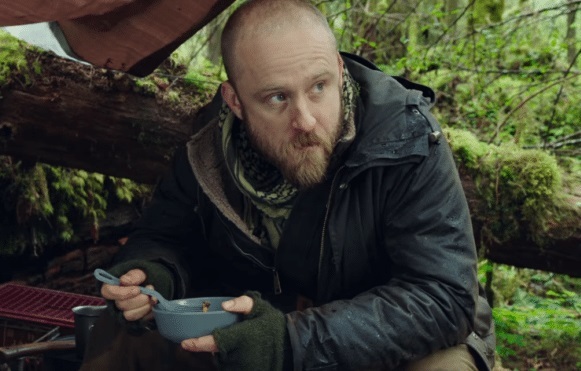 In Leave No Trace, it’s Portland’s Forest Park. 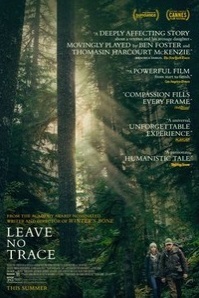 Based on the novel My Abandonment by Peter Rock, a writer whose work often reflects the thoughts and yearnings of outsiders, those who live on the edge of society, Granik’s Leave No Trace takes the true story of a father and daughter who were found living deep within the park and creates its own character-driven narrative. 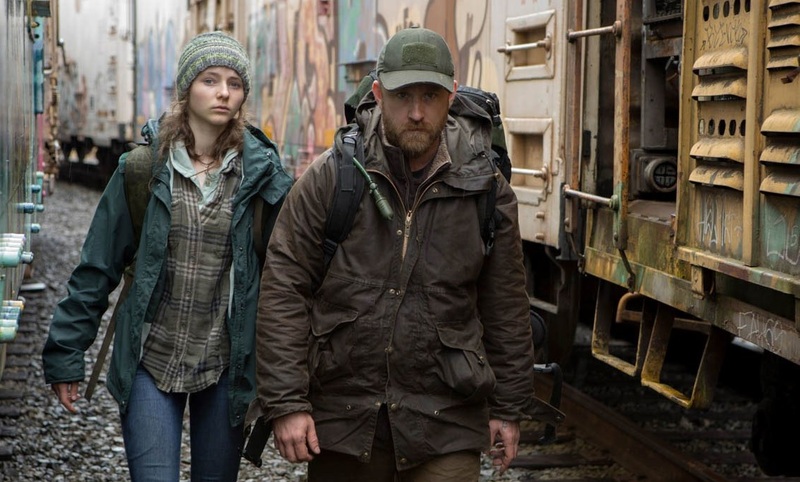 Will (Ben Foster) and his thirteen-year-old daughter, Tom (Thomasin McKenzie) live illegally in the nature preserve under a makeshift shelter in isolation. They eat whatever they find, they create fire by hand, and they drink rainwater. It’s only when there’s a desperate need for something that can’t be found in the preserve that father and daughter leave their base, trek through the woods, and walk into the nearby town. With no income, Will, a veteran, sells his PTSD medication and uses whatever he makes to buy supplies. But their existence is discovered. In a moment of unintended negligence, Tom is spotted, then reported. It’s not long before park rangers start searching the grounds. While playing a game of chess together, a noise from the distance breaks the silence of their backwoods existence. Will pauses his play and listens. It’s the sound of an approaching dog. “This is not a drill,” he tells his daughter. The two suddenly leap to action and make an urgent, hasty retreat. But it’s not long before both father and daughter are found. The intent of a concerned social worker (Dana Millican) is obvious. While some audiences may find sympathy in the plight of Will and his rejection of civilization, there’s no denying the need of something safer and more stable for Tom, his teenage daughter. When tested on her reading and writing abilities, something her father has taught, the social worker is surprised to discover that Tom actually reads considerably higher than her grade level. It’s impressive, but more is required, like attending school full time. “School is about social skills, too,” the worker adds. Curiously, with an emphasis on character more than plot, there’s a not a great deal we learn regarding Will’s background. We know his wife has passed away, and there’s a reference to his time spent in the military, but that’s it. What made him eventually reject society, take his daughter and disappear is never explored. The film focuses more on the contrasts and needs of this unconventional family unit. Will’s inability to conform to social norms is always evident. When given both a job and a temporary home, instead of sleeping in the comfort of the bedroom, Will and Tom rest outside under the stars in the backyard. “We’re gonna make the best of it,” he states. But, as we soon discover, he has little intention of remaining. Tom, on the other hand, appears willing to accept what a new life might bring, including certain material things denied her while isolated. When suggesting it might be a good idea to each have a phone, Will is appalled. “We’re wearing their clothes, eating their food, doing their work. We’ve adapted!” he insists. The film’s strengths are considerable, particularly with the casting. Both Ben Foster and New Zealand newcomer Thomasin McKenzie convince as father and daughter. Mckenzie is thoroughly engaging as the young girl, while Foster successfully shuns the baggage of previous downbeat portrayals and surprisingly makes his Will someone to root for. His concern and protective nature for Tom, though misguided, is to be admired. But with a running time of 108 minutes, what initially intrigues finally loses its hold. 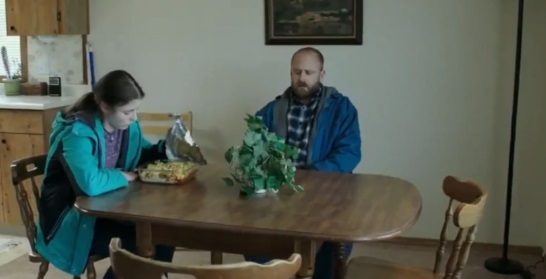 Unlike Winter’s Bone with its mounting sense of mystery, Leave No Trace has no such arc to its telling; there’s no perceivable hook to keep you engaged other than a concern for what the future may bring to these two likable people. When Will wakes Tom in her room at the house and whispers, “Pack your things. Don’t take anything you don’t need,” there’s a sense that maybe the film has begun to head in a different direction, but returning back to the woods is only the beginning of the third act, not the film’s climax. While there’s undeniable respect for Tom’s desire to be completely off the grid, at the fade out, this nuanced, slow-burn eventually feels too long in order to tell its tale.